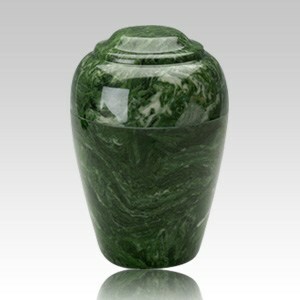 The Grecian Emerald Marble Cremation Urn is made from cultured granite material. The urn can be displayed at home or at the mausoleum. This cremation urn is made for burial as well and can be used as an urn vault for the cemetery or any other place. Create a peaceful resting place for eternity. "Both keepsake urns I ordered for my cats turned out absolutely beautiful! My cats passed away only 7.5 months apart and I wanted to get a similar urn for my second cat and I wanted to make sure that the engraving was done in the same way as the first one. I called after I placed my order and told the representative I talked to about my concerns and they were very understanding and helpful and suggested that I send a picture of the engraving on the first urn. So I was able to email that to them and they replied right away saying that my email and picture was forwarded on to the engraver. The urn arrived and it was exactly how I wanted it and I was absolutely thrilled. Thank you so much for your compassion and excellent service. It really means a lot!"